WHAT COMES PRELOADED ON THE SHIELD TABLET? 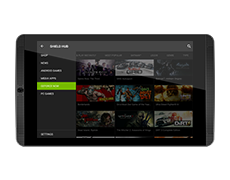 WHAT ARE THE SYSTEM REQUIREMENTS FOR STREAMING PC GAMES TO THE SHIELD TABLET? The full list of supported GTX GPUs for Notebook is: 880M, 870M, 860M, 850M, 780M, 770M, 765M, 680M, 675MX, 670MX, and 660M. Routers: 802.11a/g router (minimum). 802.11n dual band router (recommended). Check out a list of GameStream-ready routers. How do I move app and game program (APK + OBB) files from the SHIELD TABLET's internal storage to the microsd card? The ability to move data to SD card is variable for select apps and games. Only apps that developers have opted in as moveable to external storage can be moved. The SHIELD tablet only supports writing to FAT32 and NTFS formatted cards. 64 GB (or higher) microSD cards – Android does not support the exFAT file system out-of-the-box. Because the standard FAT32 file system does NOT support partitions greater than 32 GB by default, 64 GB cards come pre-formatted as exFAT. If you want to use a 64 GB microSD with the SHIELD tablet, it has to be converted to a file system format that is supported by stock Android, which in this case is NTFS. This can be done using a PC. Android KitKat significantly changes the way applications are allowed to use SD cards. If you use SD Card to store data, please read here for further details. WHAT CONTROLLERS ARE COMPATIBLE WITH THE SHIELD TABLET? NVIDIA recommends the SHIELD controller for the ultimate gaming experience. It was designed to work perfectly and seamlessly with SHIELD tablet. HOW CAN I SHARE MY SHIELD TABLET'S GAMEPAD MAPPER PROFILES WITH THE COMMUNITY? With the community profiles feature in Gamepad Mapper, users can share, browse, and rate community-generated game profiles. To access the feature, hold the Start button from within an Android game to access the Gamepad Mapper user interface, then select either the browse (cloud icon with a green down arrow) or share button (green share icon to the right of the browse button) to access the community features. WHAT ACCESSORIES ARE AVAILABLE FOR THE SHIELD TABLET? There are two accessories available at launch—the SHIELD game controller and a SHIELD tablet magnetic cover. The SHIELD controller is an advanced game controller designed for serious gamers. It has precision controls with support for BOTH Android and PC and uses an ultra-responsive Wi-Fi Direct connection, resulting in lower latency than standard Bluetooth controllers. You can also plug your gaming headset into the included 3.5mm stereo jack, use the integrated mic for game chat and voice search, and control volume using the integrated volume rocker. The SHIELD magnetic cover provides protection for the display as well as different viewing angles using the integrated magnets that work in unison with the body of the tablet. All accessories are available for purchase from NVIDIA at shield.nvidia.com. This technology gives gamers the ability to record and share their greatest gaming moments when playing their favorite PC games using GameStream. Twitch integration lets gamers instantly broadcast gameplay in HD. Using the SHIELD tablet, gamers can capture and broadcast their likeness using the integrated camera, along with their gameplay. WHAT TYPE OF MICRO USB ETHERNET ADAPTER DO I NEED TO STREAM GAMES AT 1080P @60 FPS? There are many different types of Micro USB Ethernet adapters available in the marketplace. The adapter must be a male Micro USB connector to a female Ethernet connector. NOTE: A Micro USB Ethernet adapter can be used, but the SHIELD tablet cannot be charged with this type of adapter. To charge the SHIELD tablet while using Ethernet, a Micro USB Y-Cable with inputs for female Micro USB, male Micro USB, and female full-size USB 2.0 will need to be used. Additionally, a full-size USB 2.0 Ethernet adapter will be needed in conjunction with the Y-Cable. Lastly, for this adapter to function properly, all external peripherals must be plugged into the Y-Cable first with the male Micro USB connector (of the Y-Cable) inputted into SHIELD last. WHAT ARE THE REQUIREMENTS TO STREAM GAMES AT 1080P @ 60 FPS? Micro USB Ethernet Adapter: Connect a wired Ethernet cable from your router to your SHIELD. HOW DOES STREAMING GAMES FROM MY PC TO SHIELD WORK? NVIDIA uses the H.264 encoder built into GeForce GTX 650 or higher desktop GPUs, along with special streaming software integrated into GeForce experience, to stream games from the PC to SHIELD over the user's home Wi-Fi network with ultra-low latency. Gamers use SHIELD as the controller and display for their favorite PC games as well as for Steam Big Picture. This enables gamers to get a GeForce GTX PC gaming experience anywhere in their home Wi-Fi network. WHAT PC GAMES DOES THE SHIELD TABLET WORK WITH? Check out the complete list of supported PC games. WHAT USB DEVICES ARE SUPPORTED ON THE SHIELD TABLET? The SHIELD tablet supports a variety of USB devices, including headphones, speakers, keyboard, mouse, and connection to other devices such as a PC for file transfer. While other USB power adapters 'might' work, we encourage you to use the adapter that came with your SHIELD tablet, as it both optimizes how quickly your device can charge and ensures that no damage can be done by over-charging. WHAT IS THE AUDIO OUTPUT OF THE SHIELD TABLET? Two front-facing stereo speakers with a wide frequency range, and two unique bass reflex ports deliver bass response unmatched by any tablet on the market. At the heart of the SHIELD tablet's audio excellence is the NVIDIA PureAudio™ technology that extends the frequency range to provide deeper lows and crisper highs. The 3.5 mm headphone jack supports a microphone and stereo headphone combo. For cinema experience, SHIELD tablet also supports audio over HDMI. WHAT CELLULAR NETWORKS DOES THE SHIELD TABLET LTE SUPPORT? There are two versions of SHIELD tablet LTE. There is a North American version that works on AT&T, T-Mobile and Rogers on LTE bands 2, 4, 5, 7, and 17 and HSPA bands 1, 2, 4, 5. There is a second International version that works on popular European and Asian networks. It supports LTE bands 3, 7, 20 and HSPA+ bands 1, 2, 5, 8. Check with your favorite carrier to verify coverage in your area. Is SHIELD Tablet 32GB/LTE compatible with Roger’s micro-SIM? SHIELD Tablet 32GB/LTE is unlocked and is compatible with Rogers LTE network. Simply remove the existing AT&T Micro-SIM and replace it with a Micro-SIM from Rogers. Will the SHIELD Tablet 32GB/LTE support other carriers besides Rogers in Canada? SHIELD Tablet 32GB/LTE is compatible with the following bands in North America – LTE: 2,4,5 7, 17 (1900, 1700, 850, 2600, 700) / HSPA+: 1, 2, 4, 5 (2100, 1900, 1700, 850) Please check with your carrier to confirm supported bands. Can I make voice calls with the SHIELD Tablet 32GB/LTE in Canada? No, voice calls are not supported. However, with a compatible data plan and the applicable software such as Skype, data calls are possible. WHAT IS THE SHIELD TABLET'S WARRANTY PERIOD? 1-year limited manufacturer's warranty. See shield.nvidia.com/support/warranty for warranty details. HOW DO I UPDATE THE SHIELD TABLET? This is a simple process. All software updates for the SHIELD tablet are directly pushed out by NVIDIA. You'll see a notification when an update is available. Once you confirm, the system will automatically download and apply the update when you have sufficient battery life.